Light, fluffy snow can be up to 90% trapped air — just the thing to keep birds and other animals warm. 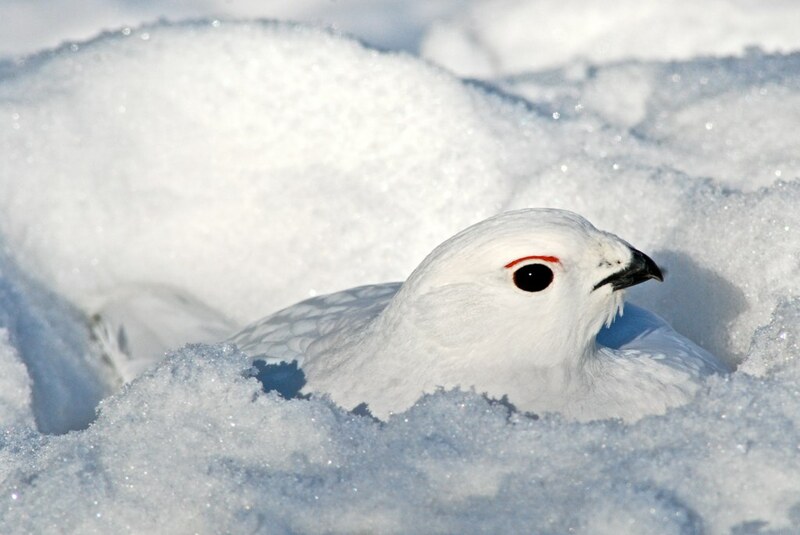 Ptarmigan spend winter nights in cozy caves they excavate in snow. During truly harsh weather, they will hunker down in their caves through the short arctic day, too. Common Redpolls break through the snow with their heads, then burrow horizontally for up to a foot and a half. Come morning, when the sunshine warms the air, they pop up out of the roosting cave, leaving the smooth blanket of snow pocked with redpoll-sized craters. Support for BirdNote comes from Bloomsbury, announcing the new book "Winter Birds" with paintings by artist and ornithologist Lars Jonsson. Available wherever books are sold. Common Redpolls move south to escape the arctic winter. But even then, their wintering grounds in southern Canada and the northern US can be snowy. These tiny, goldfinch-like birds with the bright red cap break through the snow with their heads, then burrow horizontally for up to a foot and a half. Come morning, when the sunshine warms the air, they pop up out of the roosting cave, leaving the smooth blanket of snow pocked with redpoll-sized craters. Something to look for next time you’re out in your down parka with a thermos of hot chocolate. For BirdNote, I’m Mary McCann. Bird sounds provided by The Macaulay Library of Natural Sounds at the Cornell Lab of Ornithology, Ithaca, New York. Willow Ptarmigan  by Leonard J. Peyton. Common Redpoll  by Bob McGuire.